A-HOTEL.com - Luxury and cheap accommodation in Severka, Russia. Prices and hotel, apartment booking in Severka and surrounding. This hotel is located in a quiet area of parkland on the Shirokoy River, a 15-minute walk from Ekaterinburg city centre. The Izumrud Hotel features a beautiful garden terrace. 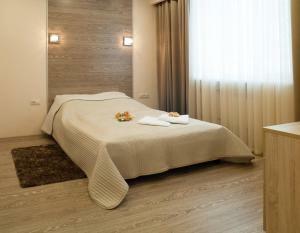 Located in Yekaterinburg, Light Hotel on Bebelya Street features a sauna and free WiFi. The rooms offer a TV, minibar and private bathroom. Komatek Hotel is offering accommodation in Yekaterinburg. Among the facilities of this property are a restaurant, a 24-hour front desk and an ATM, along with free WiFi. Situated in Ekaterinburg, Vizavi Hotel offers an indoor pool, sauna and an on-site restaurant. Its décor combines 70s style with vibrant colours and a modern design. Волгоградская 220 in Yekaterinburg offers accommodation with free WiFi, 3.1 km from Cathedral of St. Located in Yekaterinburg, 4 km from Ploshchad 1905 goda Metro Station, Evro Apartment offers self-catering accommodation with free WiFi access. The modern apartment has a flat-screen cable TV.